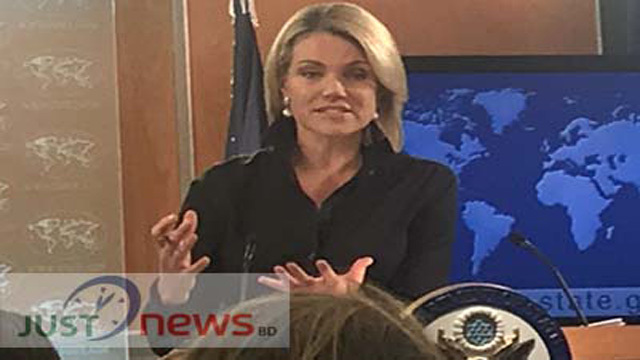 M Mushfiqul Fazal from Washington, Dec 20 (Just News): Spokesperson for the United States Department of State Heather Nauert said, US wants voluntary, safe, and dignified return of Rohingya people . The situation of Myanmar is not safe yet for the repatriation. Heather Nauert came up with this comment at a regular State Department briefing held in Washington on Tuesday. At the briefing Bangladeshi journalist Mushfiqul Fazal asked about an agreement between Bangladesh and Myanmar to repatriate thousands of refugees. Fazal asked, Human Rights Watch has claimed satellite images shows that dozens of Rohingya villages were burned the week Myanmar signed an agreement with the Bangladesh to repatriate hundreds of thousands of refugees. The evidence shows that villages were still being damaged as late as 2nd December contradicted assurance by the Burmese Government that violence had ceased and that the Rohingya could safely return to Myanmar, the watchdog said. Bangladesh and Myanmar signed an agreement on 23rd November to begin the proceed of repatriating some of the estimated 650000 refugees who fled Myanmar in the past four months. In response the State Department spokesperson said we hope that the refugees will eventually be able to go home, to go home to Burma. More than 600,000 of them have been forced across the border since August alone and now it’s December. Bangladesh has been so generous in accepting hundreds of thousands of refugees. The U.S. Government has provided significant financial assistance to help with that. I want to be clear that that financial assistance goes directly to aid groups. That financial assistance does not go to the individuals. I want to be clear about that, she added. Heather said, in terms of the repatriation plan, we’d like to see the plan. We’ve heard about it in concept. But one of the things that would be important to be in that plan is the voluntary, safe, and dignified return. So it has to be voluntary. People have to feel like it’s safe to go home. If they don’t feel like it’s safe to go home, it’s probably not going to be safe to go home. The US Spokesperson said, they have to have a dignified return. That means treating the people well as they decide to return home. It also needs to be voluntary. They can’t be forced to leave one country to go to another country. They have to feel safe and ready to go home. We don’t think that that situation calls for it just yet, she added. Heather said, unfortunately, I think it’s probably not safe for them to go home at this point, but we’re continuing to assess the situation and continuing to have our conversations not only with the Bangladesh Government, but also with the Burmese Government.